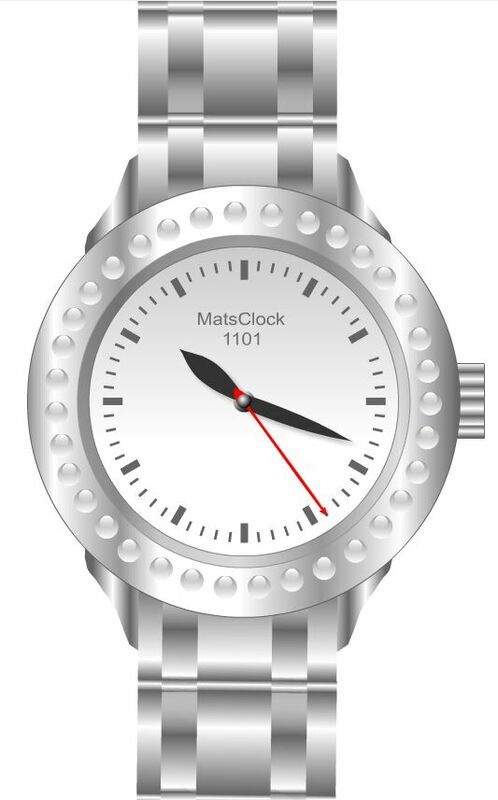 After I designed the previous free flash clock MatsClock 1100 which was a golden wrist watch, I thought of converting the same clock design into a diamond studded wrist watch with a steel frame. Because men's watches are supposed to be a little larger, I have given this free flash clock a larger outter dial. The golden pearls or diamonds on the outter clock dial was replaced with white steel pearls. Over all this free flash clock is looking nice. I did not change the hour needles and minute needles in this flash clock. A slightly grey clock dial was considered in this flash clock to add lustre. I removed the black background also because grey can stand out in white as beautifully as any other color. This is a good wrist watch design. Some day, I am sure the watch companies will want to replicate my free flash clocks and flash wrist watches designs.